Infrared temperature sensors are ideal in applications where precise monitoring and control of temperature is required. These devices cover a broad range of temperatures with extreme accuracy using infrared technology that offers non-contact performance. When you need precision spot temperature measurement with unmatched accuracy and reliability for a wide range of industrial applications, rely on the Land Cyclops L family. Trust these handheld devices to ensure accurate sighting by the clear, wide-angle (9°) field of view and small, clearly defined (1/3°) measurement area. They also provide emissivity compensation via the icon-based menu system. Plus, the operating waveband has been carefully chosen to minimize minimize errors due to uncertainty in emissivity and the effects of atmospheric vapor components. Measure true liquid metal temperature with the Cyclops 055L Meltmaster, which uses an advanced, noise-rejection processing mode that allows the real liquid metal temperature to be measured. It ignores the high-temperature sparks and low-temperature water vapor, dust and smoke that typically cause errors in the real liquid metal temperatures. This device’s focusing is fixed at 5m/16ft. It’s ideal for blast furnace, BOF and EAF tapping, metal forging and casting, liquid metals and metal foundries. The Cyclops 100L measures high temperatures—precisely. Measured temperature is displayed in four simultaneous modes: continuous, peak, mean and valley (with user-selected mode for the viewfinder display). Temperature-measurement resolution is as precise as 0.1°. Focusing is variable from 1m to infinity, with close focus options available using auxiliary lenses. It’s ideal for steels, metals, glass, ceramics and more. The Cyclops 160L is designed to accurately measure medium temperatures. Similar to the 100L, measured temperature is displayed in four simultaneous modes: continuous, peak, mean and value (with user-selected mode for viewfinder display). Temperature-measurement resolution is as precise as 0.1°. 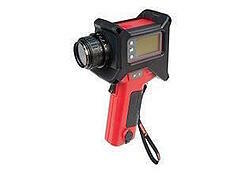 The unique features of the Cyclops 390L portable non-contact pyrometer make it the ideal instrument for accurate non-contact temperature measurements in hydrocarbon-fueled furnaces. Operating at 3.9um (a transmissive waveband) for hot targets, water vapor and CO2 are invisible. Reformer tubes are very expensive, so periodic refractory checks can identify potential failure before it happens. In instances where measurement errors due to hotter backgrounds are a problem, errors can be minimized using the Cyclops 390L. The measured temperature is displayed in four simultaneous modes: continuous, peak, mean and value (with user-selected mode for viewfinder display). Accurate sighting is ensured by the clear TTL optics, and focusing is variable from 1m to infinity, with close focus options available using auxiliary lenses. It’s ideal for reformer and heater tubes and reheat furnaces. To learn more about our industrial infrared temperature solutions, or any of our full line of products, please contact us.